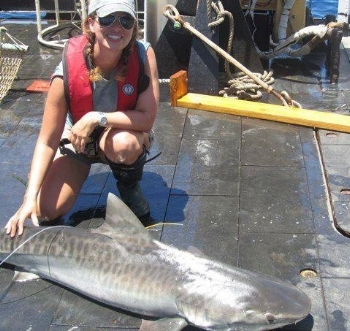 Shoals Marine Laboratory (SML) is offering a course in Shark Biology & Conservation July 29 - August 12 2019. The last 30 years have produced an explosion of new information on the biology of the approximately 1,000 living species of sharks, skates, rays, and chimaeras, which collectively make up the group Chondrichthyes. This course will cover advanced topics in the evolution, diversity, anatomy, functional morphology, physiology, sensory systems, behavior, reproduction, development, and conservation of cartilaginous fishes. Read more about the course objectives here. The course is being taught by Gills Club co-founder, Dr. Heather Marshall. -Scholarship is only available to female applicants. -Students must submit transcripts that support an average GPA of 3.5. Exception: Employed students with an average GPA of 3.0-3.49 can still apply but must include a proof of employment letter from a supervisor, that shows work hours and length of employment . What would it mean for you to take Shark Biology and Conservation at SML? How would this course contribute to your future career goals?